Admit it, you were slightly confused when you got your email about SDCC Child-to-Junior Validation today. The very first line reads, "If your child attended Comic-Con 2018 with a paid adult attendee they may be eligible to participate in our Comic-Con 2019 Returning Registration badge sale!" Badge sale. Returning Registration. It seems a little soon to hear those words, doesn't it? But it isn't, really - we had Pre-Reg in August in other years, and of course we all remember that we had both Returning Reg and Open Reg last year before the holidays. There's no telling when CCI is going to spring the next badge sale on us, though we do know it will be after 6 September. That's the deadline for validating your children for the sale. You may still have a stack of unread comics from this year's Con, but you might also be only weeks away from buying next year's badge. Of course, it's Returning Reg so there isn't much to prepare for - you already know the drill. 2018 first-timers, this will follow the same process you went through in Open Registration. (Unless they change it.) The good news is that you'll be competing only with your fellow attendees and not the public at large. Getting a badge is not guaranteed but you also can try again in Open Reg. On the whole, it pays to be a returning attendee. And if you do need to validate your kid, you'll need their physical badge from this year. This should help. I received the same email, too. And I thought, man that's really soon. 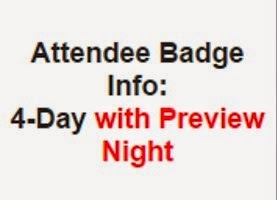 But the holidays are around the corner, kids are going back to school, and the buying badges early for the returning people is a right of passage. This was my first year. So if I can be in this sale does this mean I can get badges for other people? No. You can only buy for other people who were 2018 attendees. BUT you can get your friends in Open Reg.